There's a lot that I like about this recipe just by looking at it. For one, you can use a bunch of vegetables you just have on hand. This would have been great for whatever you had growing in your victory garden or for spare vegetables you had on hand. It's a great way of getting in a lot of vegetables with your meal too. I think this is considered a main dish with the addition of a few delicious strips of bacon. 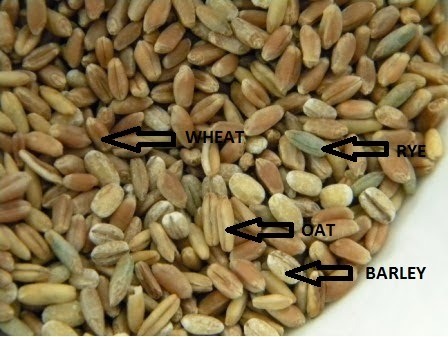 If you look closely you can see the different types of grain - wheat, rye, barley, & oats. I used 9 tablespoons of wheat and 1 tablespoon of the other grains combined. Well, it's not 100% the same. Wheat then is a bit different than wheat today. Also, national flour used wheat that had an 85% extraction while this is 100% - straight from my grinder. Now I'm ready to start my recipe. I like this little cartoon below from my British Victory Cookbook. "Why is a potato like a lump of sugar?" In the 1940s their view of starch and sugar was a bit different than today. Sugar was considered a good energy food along with starch. The British government was also very big into encouraging the British public to eat potatoes "in their jackets" for the nutrients. Potatoes were filling without the use of grain or meat. "Why is a potato like a lump of sugar?" Bread crumbs, cabbage, potatoes, leek, celery, carrots, bacon, butter, and national flour! First I needed to gather my vegetables, clean them, and cut them up. After cooking the vegetables, I arranged them in an oven-proof dish. Well, I used two dishes because my Fire King dish was too small. I made a sauce of the melted butter, national flour, and the vegetable water - which is essentially a white sauce. I love how they emphasize using that vitamin-rich water! I had to add a little extra water to thin the sauce out some more. (I also cheated a bit and ground some pepper over the vegetables.) Then I poured the sauce over the veg, laid the bacon out over the top and then sprinkled on the bread crumbs. I broiled it on 375º in my toaster oven for about 20 - 25 minutes. Everyone's oven is different, so you'll want to broil it until the bacon is crisp and the bread crumbs are browned. Yummy! My husband took this picture, because I had to leave for a chiropractor appointment. Incidentally, this is what was served for dinner! I can see how it would have made a good main meal. Personally, I'm sensitive to starchy foods like potatoes, so I couldn't eat too much of it. But as my husband said, "It's pretty tasty!" Give it a try! You can always substitute different veggies that are lurking in your crisper drawer. :-) And you don't need national flour to give it a try, either. The recipe says you can use fine oatmeal - something you can make in your food processor. Making your own national flour! Wow!